The keffiyeh or kufiya (Arabic: كُوفِيَّة‎ kūfiyyah, meaning "from the city of Kufa" (الْكُوفَة); plural كُوفِيَّات kūfiyyāt), also known as a ghutrah (غُترَة), shemagh (شُمَاغ šumāġ), ḥaṭṭah (حَطَّة), mashadah (مَشَدَة), chafiye, dastmal yazdi (Kurdish: دستمال یزدی‎) or cemedanî (Kurdish: جه مه داني‎), is a traditional Middle Eastern headdress worn in the Middle East with origins from the Fertile Crescent (Iraq, the Levant, and Egypt) fashioned from a square scarf, usually made of cotton. It is commonly found in arid regions as it provides protection from sunburn, dust and sand. Toward the end of the 1980s, the keffiyeh became a fashion accessory in the United States and, during the 2000s, it became very popular among teenagers in Tokyo, Japan, where it is often worn with camouflage-style clothing. During his sojourn with the Marsh Arabs of Iraq, Gavin Young noted that the local sayyids—"venerated men accepted [...] as descendants of the Prophet Muhammad and Ali ibn Abi Talib"—wore dark green keffiyeh (cheffiyeh) in contrast to the black-and-white checkered examples typical of the area's inhabitants. Many Palestinian keffiyehs are a mix of cotton and wool, which facilitates quick drying and, when desired, keeping the wearer's head warm. The keffiyeh is usually folded in half (into a triangle) and the fold worn across the forehead. Often, the keffiyeh is held in place by a circlet of rope called an agal (Arabic: عقال‎, ʿiqāl). Some wearers wrap the keffiyeh into a turban, while others wear it loosely draped around the back and shoulders. A taqiyah is sometimes worn underneath the keffiyeh; in the past, it has also been wrapped around the rim of a fez. The keffiyeh is almost always of white cotton cloth, but many have a checkered pattern in red or black stitched into them. The plain white keffiyeh is most popular in the Arab states of the Persian Gulf—in Kuwait and Bahrain to the exclusion of almost any other style. The keffiyeh is worn by men of all ages, whether on the head or around the shoulders. In Jordan, the red-and-white keffiyeh is strongly associated with the country and its heritage, where it is known as the shemagh mhadab. The Jordanian keffiyeh has decorative cotton or wool tassels on the sides; the bigger these tassels, the greater the garment's supposed value and the status of the person wearing it. It has long been worn by Bedouins and villagers and used as a symbol of honor and/or tribal identification. The tasseled red-and-white Jordanian shemagh is much thicker than the untasseled red-and-white shemagh seen in Persian Gulf countries. In Egypt, the keffiyeh and the agal is worn by Bedouins specially in the Sinai Peninsula. It is also sometimes tied into a turban in varying styles. In Yemen, the keffiyeh is used extensively in both red-white and black-white pattern and in some traditional Yemeni designs and colours. Before the 1950s, multi-colored tribal shemagh were used widely; nowadays, these are mostly worn only in Yemen and Oman, while the black/white, red/white or pure-white styles have come to dominate in the countries of the Persian Gulf and Levant. The shemagh is part of an ancient Middle Eastern headgear tradition. In Malaysia, the keffiyeh has been worn by Muslim women as part of hijab fashion and during the Palestinian struggle against Israel. Many Malaysians wore it to show solidarity for Palestine. In Turkey it was forbidden to wear a Keffiyeh because it was seen as evidence of support of the PKK. The keffiyeh, especially the all-white keffiyeh, is also known as the ghutrah. This is particularly common in the Arabian Peninsula, where the optional skullcap is called a keffiyeh. The garment is also known in some areas as the ḥaṭṭah. A piece of white/orange/black cloth made from wool and cotton, worn primarily by Palestinians. A piece of cloth, usually made of cotton or flax and decorated with many colors, but usually red and white; worn primarily by Saudi Arabians, Emiratis, Jordanians, and Iraqis. A traditional scarf in Iran, originally from the Yazd region of Iran. A style of Keffiyeh that originated in Iran, based on the Iranian Dastmaal Yazdi with influences from the Palestinian Keffiyeh. Often worn by Shi'a Muslims in Iran as well as Iraq and Lebanon to express support for Shi'a Political parties. The scarf gained popularity during the Iran-Iraq war as a sign of Shi'a resistance against Saddam. The Chafiyeh is also worn by Basij members of the Iranian Revolutionary Guard Corps, Hezbollah, as well as occasionally by members of Iraq's Popular Mobilization Forces, but also by ordinary Shia religious pilgrims not affiliated with any political group. A piece of white cloth made of cotton mild, worn in western Iraq and by the Arabs of the Persian Gulf states. It is worn by inhabitants of North Africa. Traditionally worn by Palestinian farmers, the keffiyeh became worn by Palestinian men of any rank and became a symbol of Palestinian nationalism during the Arab Revolt of the 1930s. Its prominence increased during the 1960s with the beginning of the Palestinian resistance movement and its adoption by Palestinian leader Yasser Arafat. The black-and-white fishnet pattern keffiyeh would later become Arafat's iconic symbol, and he would rarely be seen without it; only occasionally would he wear a military cap, or, in colder climates, a Russian-style ushanka hat. Arafat would wear his keffiyeh in a semi-traditional way, wrapped around his head via an agal. He also wore a similarly patterned piece of cloth in the neckline of his military fatigues. Early on, he had made it his personal trademark to drape the scarf over his right shoulder only, arranging it in the rough shape of a triangle, to resemble the outlines of historic Palestine. This way of wearing the keffiyeh became a symbol of Arafat as a person and political leader, and it has not been imitated by other Palestinian leaders. Another Palestinian figure associated with the keffiyeh is Leila Khaled, a female member of the armed wing of the Popular Front for the Liberation of Palestine. Several photographs of Khaled circulated in the Western newspapers after the hijacking of TWA Flight 840 and the Dawson's Field hijackings. These photos often included Khaled wearing a keffiyeh in the style of a Muslim woman's hijab, wrapped around the head and shoulders. This was unusual, as the keffiyeh is associated with Arab masculinity, and many believe this to be something of a fashion statement by Khaled, denoting her equality with men in the Palestinian armed struggle. The colors of the stitching in a keffiyeh are also vaguely associated with Palestinians' political sympathies. Traditional black and white keffiyehs became associated with Fatah. Later, red and white keffiyehs were adopted by Palestinian Marxists, such as the PFLP. The color symbolism of the scarves is by no means universally accepted by all Palestinians or Arabs. Its importance should not be overstated, as the scarves are used by Palestinians and Arabs of all political affiliations, as well as by those with no particular political sympathies. The wearing of the keffiyeh often comes with criticism from various political factions in the ongoing Israeli–Palestinian conflict. The slang "keffiyeh kinderlach" refers to young Jews, particularly college students, who sport a keffiyeh around the neck as a political/fashion statement. This term may have first appeared in print in an article by Bradley Burston in which he writes of "the suburban-exile kaffiyeh kinderlach of Berkeley, more Palestinian by far than the Palestinians" in their criticism of Israel. European activists have also worn the keffiyeh. Today, this symbol of Palestinian identity is now largely imported from China. With the scarf's growing popularity in the 2000s, Chinese manufacturers entered the market, driving Palestinians out of the business. In 2008, Yasser Hirbawi, who for five decades had been the only Palestinian manufacturer of keffiyehs, is now struggling with sales. Mother Jones wrote, "Ironically, global support for Palestinian-statehood-as-fashion-accessory has put yet another nail in the coffin of the Occupied Territories' beleaguered economy." British Colonel T. E. Lawrence (better known as Lawrence of Arabia) was probably the best-known Western wearer of the keffiyeh. 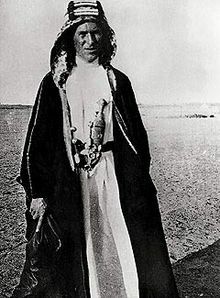 He wore a plain white one with agal during his involvement in the Arab Revolt in World War I. This image of Lawrence was later popularized by the film epic about him, Lawrence of Arabia, in which he was played by Peter O'Toole. The 1920s silent-film era of American cinema saw studios take to Orientalist themes of the exotic Middle East, possibly due to the view of Arabs as part of the allies of World War I, and keffiyehs became a standard part of the theatrical wardrobe. These films and their male leads typically had Western actors in the role of an Arab, often wearing the keffiyeh with the agal (as with The Sheik and The Son of the Sheik, starring actor Rudolph Valentino). Erwin Rommel also commonly wore a keffiyeh around his neck during the Western Desert Campaign for practical reasons. For decades, keffiyeh have been issued to British soldiers who now almost exclusively refer to them as shemaghs (from Arabic شماغ šmāġ). Their use by some units and formations of the military and police forces of the former British Empire and subsequent Commonwealth dates back to before World War II. Due to its utility, the keffiyeh has been adopted by the Palestine Police Force, the Transjordan Frontier Force, the Sudan Defence Force, the Arab Legion, the Jordanian Armed Forces, the Libyan Arab Force, and the Iranian Revolutionary Guard Corps. 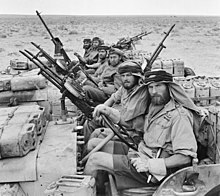 In the North African campaign of WWII the irregular British raiding and reconnaissance units of the Long Range Desert Group, the Special Air Service and "Popski's Private Army" wore them while operating in the Western Desert. After the war, their use by the British Army continued with the shemagh being worn in both desert and temperate environments in theatres such as Dhofar. Australian Army forces have also used the shemagh since the Vietnam War, and extensively during Iraq and Afghanistan, particularly by Australian Special Forces units. Since the beginning of the War on Terror, these keffiyeh, usually cotton and in military olive drab or khaki with black stitching, have been adopted by US troops as well, a reversal of previous policy which saw them strictly forbidden during the Gulf War. Their practicality in arid environments, such as Iraq, explains their enduring popularity with military personnel. Soldiers often wear the keffiyeh folded in half into a triangle and wrapped around the face, with the halfway point being placed over the mouth and nose, sometimes coupled with goggles, to keep sand out of the face. This practice is also common among armoured, mechanised and other vehicle-borne troops, who use it as a scarf in temperate climates to ward off wind chill caused by being in moving vehicles. British soldiers deploying to Iraq or Afghanistan are now issued with a tan-colored shemagh. The keffiyeh, called chafiyeh (چفیه) in Persian, were extensively used by Iranian infantrymen in the Iran–Iraq War. ^ a b c d e Lalli, Nina (15 February 2005). "Checkered Past: Arafat's trademark scarf is now military chic". The Village Voice. Archived from the original on 24 July 2008. ^ Young, Gavin (1978) [First published by William Collins & Sons in 1977]. Return to the Marshes. Photography by Nik Wheeler. Great Britain: Futura Publications. pp. 15–16. ISBN 0-7088-1354-2. There was a difference here for nearly all of them wore dark green kefiyahs (or cheffiyeh) (headcloths) instead of the customary black and white check ones. By that sign we could tell that they were sayyids, like the sallow-faced man at Falih's. ^ Uche, Onyebadi (14 February 2017). Music as a Platform for Political Communication. IGI Global. p. 214. ISBN 9781522519874. ^ a b c d e f g Kim, Kibum. "Where Some See Fashion, Others See Politics" The New York Times (11 February 2007). ^ Torstrick, Rebecca (2004). Culture and Customs of Israel. Greenwood. p. 117. ISBN 978-0-313-32091-0. ^ Binur, Yoram (1990). My Enemy, My Self. Penguin. p. xv. ^ Tipton, Frank B. (2003). A History of Modern Germany Since 1815. Continuum International Publishing Group. p. 598. ISBN 0-8264-4910-7. ^ Mudde, Cas (2005). Racist Extremism in Central and Eastern Europe. Routledge. p. 34. ISBN 0-415-35594-X. ^ a b Sonja Sharp (22 June 2009). "Your Intifada: Now Made in China!". Mother Jones. ^ Arjun Ramachandran (30 May 2008). "Keffiyeh kerfuffle hits Bondi bottleshop". The Sydney Morning Herald. Fairfax Media. Archived from the original on 29 August 2011. Retrieved 24 September 2013. ^ Arjun Ramachandran (29 May 2008). "Celebrity chef under fire for 'jihadi chic'". The Sydney Morning Herald. Fairfax Media. Archived from the original on 21 September 2011. Retrieved 24 September 2013. ^ "What do Arabs wear on their heads". UAE Style Magazine. ^ "Topshop pulls 'keffiyeh playsuit' after row over cultural theft". middleeasteye.net. Retrieved 1 September 2017. Philippi, Dieter (2009). Sammlung Philippi – Kopfbedeckungen in Glaube, Religion und Spiritualität,. St. Benno Verlag, Leipzig. ISBN 978-3-7462-2800-6. Jastrow, Marcus (1926). Dictionary of Targumim, Talmud and Midrashic Literature. ISBN 978-1-56563-860-0. The lexicon includes more references explaining what a sudra is on page 962. Wikimedia Commons has media related to Keffiyeh.